Specializing In Custom Sewn Slipcovers, Draperies, Shades, Headboards, Bench Cushions and also Renewing Your Outdoor Cushions! Sweet William Sewing Company strives to help you complete your decorating ideas. Whether you need a whole house finished with window coverings, or just a couple throw pillows for your den, I am here to help you! A kitchen roman shade or a Daughter's bedroom complete with headboard, bed linens and draperies...no design is too small, or too big! I can consult with you to see your vision and work within your budget and time frame. Slipcovers are a beautiful enhancement to your furniture and change a room's decor, whether for a season or an occasion. Slipcovers can also be used to protect prized upholstery or to cover up a spill, stain, tear or even update fabric. All slipcovers are custom fit to your piece. Details are made to your specifications...whether you want piping on the edges, a ruffled or pleated skirt, or no skirt at all! All seams are finished off inside to allow for successful laundering. They can fit as tightly as upholstery or "shabby chic" loose. Slipcover manufacturing requires a highly skilled technician and industrial sewing machines. The typical time frame of housing your piece on site is 7-14 working days. Custom slipcovered headboards are also available, made to your mattress height. Change your headboard colours with the seasons! Have fun with the amazing fabrics that catch your eye and that will give a bedroom a beautiful focal point! 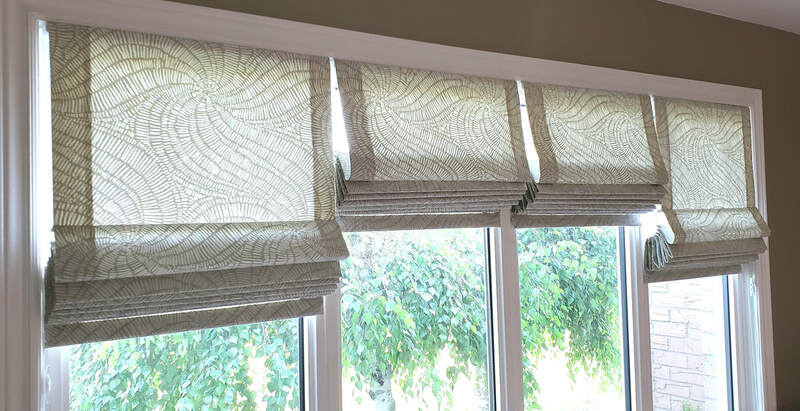 I will design any window treatment to suit your lifestyle and budget! Your home is a reflection of your personality. Roman shades are an excellent way to provide a tailored appearance suitable for a contemporary styling or a more traditional look. Romans can be made with no lining to filter light, or choose a flannel back lining to block out most light, and keep the summer sun out and winter drafts away. There are so many options when it comes to blinds or shades, the choices seem endless. But I am here to help you understand the pros and cons of each type of drape or shade so that you can make an educated decision on what type is right for you and your family.